I performed in Longview Texas at Mobberly Baptist Church during a youth ministry outreach event. There were over 700 youth in attendance that night. As the painter providing the visual, I coordinated with the speaker when I arrived to discuss his message and how it may relate to my painting. I explained the symbolism that my painting performance portrays to give him an idea of what the visual would speak to. The painting looks like a mess when it’s upside down, but when it’s flipped it all becomes clear. God takes our confused mess of a life and turns us around to make something beautiful out of our chaos. The painting turned out great. Afterwards, I was approached by a girl that wanted to thank me. She was smiling ear to ear and said that she invited some un-churched friends to the event and they were impacted by my painting performance. I thanked her for sharing that with me. I prayed that God would draw those students to Him and speak personally to them through my artwork. I pray that seeds were planted that will grow over time and become part of a great harvest. Praise Jesus. 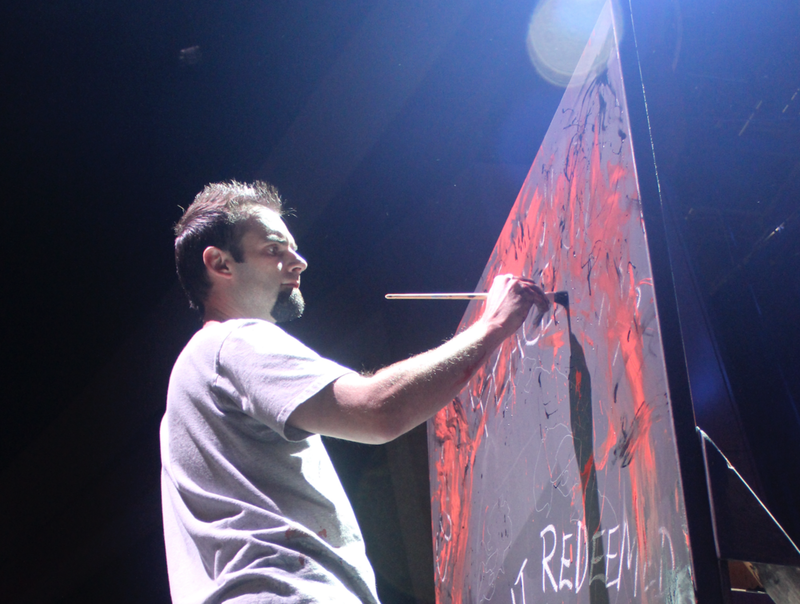 I want to encourage all of my brothers and sisters that have seen me speed paint to share their stories with me of how God used this painter to make an impact at a particular event. I love hearing these stories especially as it pertains to youth ministry. I have a big heart for sowing into the lives of youth and students because they are the future.